Spread the mustard on 1 bread slice. 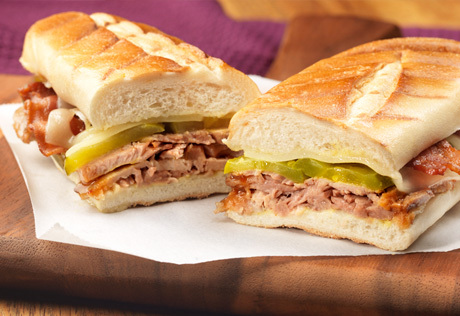 Layer the remaining bread slice with the pork, bacon, pickle and cheese and the mustard-topped bread. Heat the panini maker. Cook the sandwich for 2 minutes or until lightly browned and the cheese is melted. *To make the pork, you will need 1 pouch (12 ounces) Campbell's® Hawaiian Pork Slow Cooker Sauce, 2 to 3 pounds boneless pork shoulder and a 6-quart slow cooker. Cook time is about 7 hours on LOW.